NEW YORK, March 17, 2015 – The merging of modern design and innovative functionality is especially important when it comes to faucets, be it in the kitchen or the bathroom. Achieving perfect harmony in this delicate relationship is the world’s most popular line of faucets and fittings, GROHE Eurosmart, which has been newly redesigned. “This is the best Eurosmart has ever been,” noted Cheryl Dixon, Head of Brand Trade and Marketing for GROHE America. “Not only have we upgraded and improved the design for superior comfort, we’ve added innovative, sustainable functions,” she continued. Among them is the new 35 mm GROHE SilkMove® cartridge, which features an integrated temperature limiter ring, allowing users to set how far their handle will swivel, thus limiting temperature and avoiding the risk of scalding. The new Eurosmart range has been improved both inside and out, from its streamlined modern design to its state-of-the-art internal technology. Below, Dixon outlines more highlights of the exciting relaunch. “People want to feel at ease when using their faucets – it shouldn’t be a struggle to rinse a cup or wash your face over the sink,“ Dixon advised. By increasing the distance between the spout and the lever while raising the overall height of the faucet at the same time, GROHE designers and engineers have improved Eurosmart’s operating comfort by 10 percent, depending on the individual model. The lever is easier to reach and there is more space for the user’s hands below the spout. What makes it even more comfortable? It won’t clash: the clearly structured form effortlessly matches with most bathroom decors. 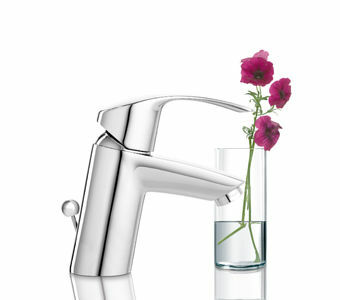 The new line of faucets also raises the bar in terms of sustainability. Equipped with GROHE EcoJoy® technology, the new faucet limits water consumption to 5.7 liters per minute without compromising the water experience. As previously noted, the new and improved 35-millimetre cartridge with integrated temperature limiter helps users manage their energy consumption while protecting them against scalding at the same time. Whether it is on major projects or in individual customer bathrooms, professional plumbers will appreciate the efficient installation of Eurosmart. GROHE QuickFix® technology, which features a fastening plate, slider-ring and metal escutcheon, speeds up the installation of all Eurosmart faucets at the sink. With the new patented locking system, Eurosmart adheres sleekly and securely with no visible screws. Architects, interior designers and consumers will love the extensive range of Eurosmart faucets and fittings. The range covers all other areas of the bathroom from the bathtub to the shower. quality, technology, design and responsibility to deliver “Pure Freude an Wasser”. With the JOYOU brand, the Group covers the fast growing Chinese market.